What do you get when you combine a very creative Japanese woman with trash from her sushi restaurant and a devastating trifecta catastrophe in her homeland? The answer: high quality trash fashion designs and relief efforts for the earth quake victims of the Tohoku region in Japan. Hisako Ishikura, known as Chako, has been living in the U.S.A. since1999. She founded a sushi restaurant, Miyabi Sushi, in the South Seattle area. Her passions in reusing her waste were jump-started when she modeled one of Robin Worley aka Rayona Visqueen’s designs at The RE Store’s 2005 Trash Fashion Show. 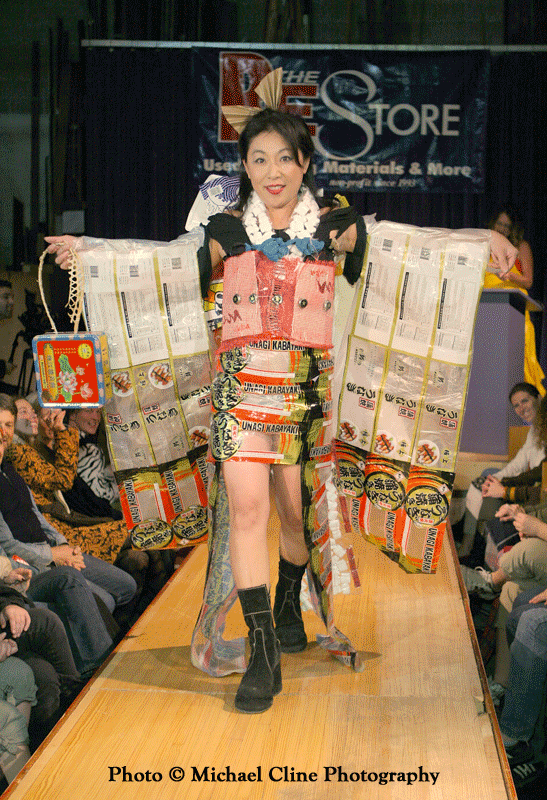 Inspired, she created her first piece, the Miyabi Kimono, for the 2006 show at The RE Store in Ballard. She has now made over a dozen ensembles, mostly created with Asian product packaging and trash. Chako has hosted trash fashion shows and Asian cultural events at her sushi restaurant on Southcenter Parkway, including live Sumi painting. Check out the auction for her donated Sumi Dragon painting to the 10th Annual Recycled Arts and Fashion Show. The earthquake, tsunami and radiation breach that took place on Mar 11, 2011 has moved Chako to raise funds for relief efforts in the Tohoku region. She is working with local businesses, including The RE Store, to get collection boxes placed in strategic locations and at events. Donation boxes will be available at the Seattle and Bellingham Trash Fashion Shows. Check out The RE Store’s Trash Fashion Show videos on youtube or photo galleries through Flickr. What have you been making out of trash?